October 25, 2016 Daniel Woodroffe, President, dwg. 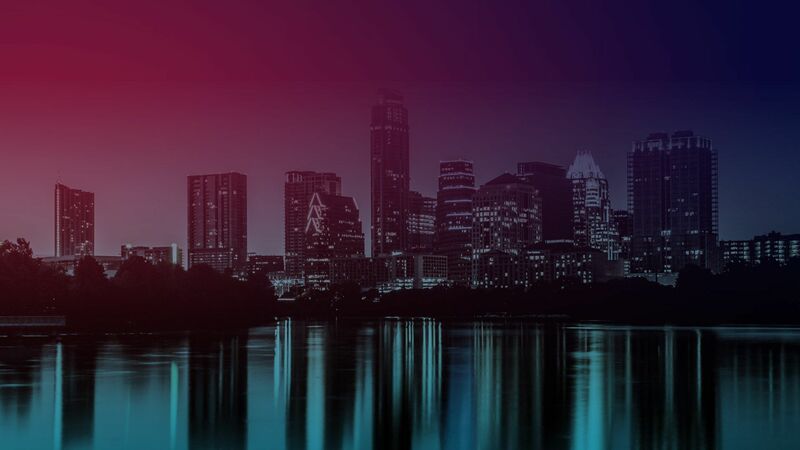 As Austin continues to rapidly transform from it’s former alternative college town persona into a highly populated, world-recognized urban destination, the role and culture of our downtown has shifted. We are growing denser by the minute and the cranes in the skyline and renderings of fancy towers in the news indicate we are not slowing down anytime soon. With new office buildings, hotels and residential destinations springing up constantly, we are asking a lot of our urban core. This density, while thrilling to an urban landscape architect like myself, puts a massive amount of pressure on downtown public space and an added level of responsibility on urban designers to be strategic about our visions for the new Austin. The implemented strategies must maximize minimal space and provide sustainable solutions that preserve and highlight the limited natural assets available downtown. Hotels, restaurants, bars, special events and our beloved urban bat population are drawing all types of people to downtown Austin, requiring designers to find the perspective of a new and diversified user base. People aren’t just coming downtown for 9 to 5 jobs anymore. They are looking for a destination to live, learn, work, stay, exercise, host guests and play in. Downtown users are looking for a destination where they can comfortably practice an all new (to Austin) lifestyle. The variety and pace of transformations offer a unique opportunity for landscape architects to practice tactical urbanism in an environment we at dwg. like to view as a “laboratory of change.” Tactical urbanism endeavors are generally small scale interventions aiming to make a portion of a city livelier or more enjoyable; more of an exceptional place intended to attract people. So how exactly do you design limited urban space to reach its maximum potential? We’ve incorporated a few strategies and tricks on our downtown Austin projects to answer this exact question. Great public open spaces do not necessarily need to be on the ground. dwg. 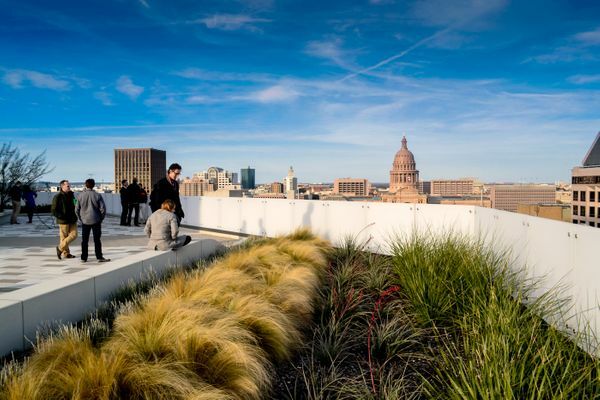 has been at the forefront of downtown Austin’s green roof renaissance. In 2012, our firm completed the renovation of the 816 Congress rooftop. 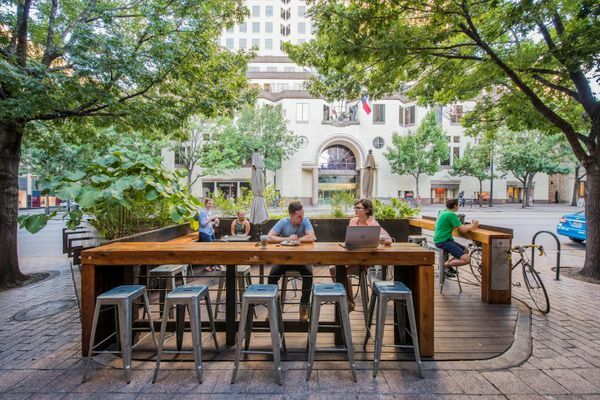 This project transformed four unsightly, previously inaccessible roof spaces at a traditional Austin office building into dynamic green space. The largest of which is now a 15,000 square foot amenity terrace. With unprecedented views of the capitol grounds, the space is used often by tenants throughout the day and rented for events in the evenings. This LEED Silver Certified project incorporates an AC-condensate harvesting system to irrigate the native, drought-resistant vegetation and replaced inefficient floodlights with a custom, LED lighting system that was carefully calibrated to match the nearby State Capitol. The project reused the existing pavers as ballast material to protect the waterproofing and secure the insulation. This adaptive reuse project is now one of many green roofs in downtown Austin. Green roofs are practically inherent on new construction as building owners and architects seek to amplify amenity space within a small footprint. With outrageous traffic delays raising the city’s collective blood pressure, visitors to downtown Austin are looking at alternative modes of transportation to traverse our urban core. A large part of Austin’s new urban lifestyle takes place outside of the car. This change requires a heightened emphasis on the pedestrian experience and pedestrian safety. Working closely with the Downtown Austin Alliance, the city of Austin, private business owners and Councilman Chris Riley and his staff, dwg. designed Austin’s first pocket patio, which opened in 2013. This pocket patio, at Royal Blue Grocery on Congress Avenue served as a pilot project for an updated patio ordinance. The ordinance allows private business owners to rent parking spaces from the city and build a semi-temporary patio spaces for customers of adjacent food and beverage vendors. This big idea allows a very small space to provide a refuge from busy sidewalks, and customers a place to gather and temporarily unwind from the bustle of downtown with new access to plants and greenery. This successful pilot project was adopted into the new ordinance, and since Royal Blue experienced such success, a second, larger patio has opened at 804 Congress. Several other pocket patios for Congress Avenue made possible by this ordinance are currently in design stages. New buildings sprouting up all over downtown are creating unprecedented competition for leasing agents at aging towers. The owners of these buildings are not blind to these challengers and are getting creative with renovations to remain aggressive in the market. The owners of One Eleven Congress, at the very active block bound by Cesar Chavez Street, Congress Avenue, Second Street and Brazos, jumped on the opportunity to revitalize their sunken plaza when gently pushed by their favorite landscape architects. The resulting design adapts the tower’s underutilized lower level garage access and sunken plaza into a dynamic gourmet food court and outdoor park space. The Fareground at One Eleven, currently under construction, features a marketplace with a variety of local cuisine alongside an open lounge and dining seating. Outside, the park will blend the existing historic oaks with a new courtyard, a custom-designed shade structure and sprawling green space. Grab and go vendors will offer quick bites for Austinites on the move and the outdoor seating will offer places of respite within the heart of downtown. Food and beverage offerings will be open well after offices close, extending the plaza’s use and adding a new nightlife destination. Fareground maximizes open space, essentially adding public space to downtown. The project preserves and highlights existing tree canopy and sustainably revives the host building. 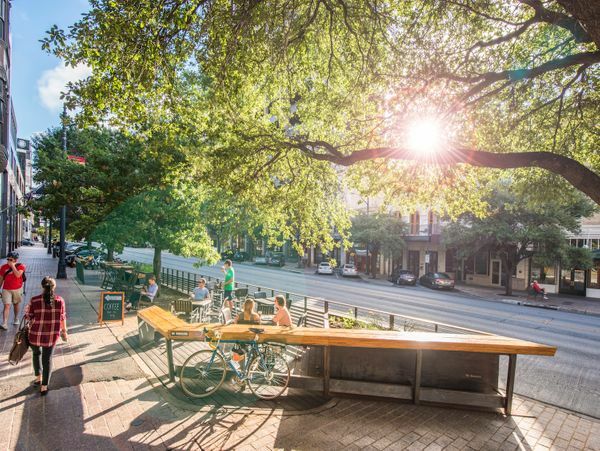 Fareground will effectively provide a place for Austin’s new downtown lifestyle. 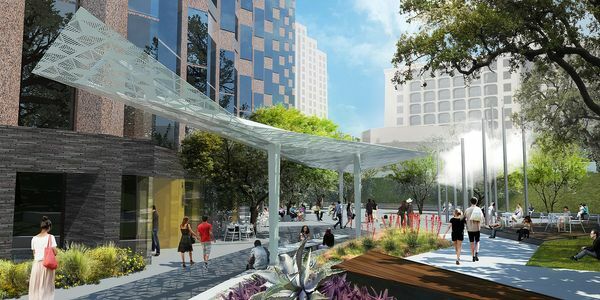 With the landscape of downtown Austin changing at an impressive rate, designers must apply tools of connectivity, open space, pedestrian priority, green roofs and sustainability to responsibly adapt our urban core to our community’s new lifestyle. We look forward to our next experiment within this thrilling laboratory of change.